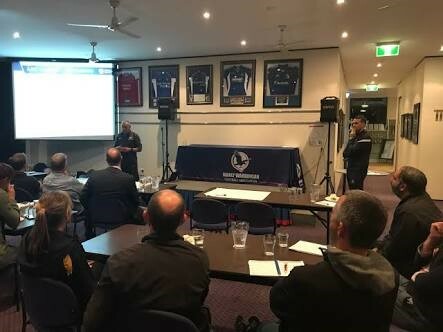 On the 31st May 2018, MWFA teamed up with Football Federation Australia and our close neighbours Northern Suburbs Football Association for the mid year review and training workshop for CCC’s and coach developers. The evening saw 25 CCC’s and coach developers from across both associations descend to Cromer Park for a night of learning and networking alongside National Community Coach Development Manager Les Bee, MWFA Community Coach Development Manager Chris Adams and NSFA Community Football Manager Ed Ferguson. The CCC program is a key priority for both associations to empower member clubs to take ownership of coach development and support their many volunteer grassroots coaches in their club environment with a “Where they are, When they are” approach to coach development. For more information on the FFA CCC program, click here.